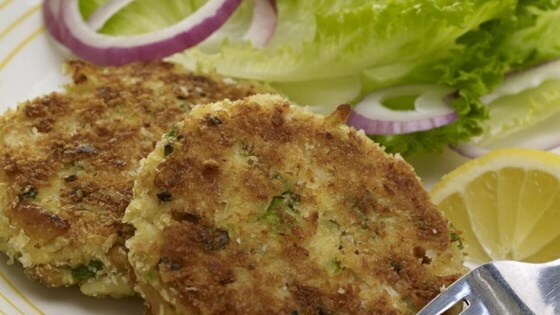 "Great crab cakes with lots of flavor and spice. Serve with homemade aioli and a crisp white wine!" Heat 2 tablespoons oil in a skillet over high heat. Saute green onions briefly until tender; cool slightly. Combine crabmeat, sauteed green onions, egg, mayonnaise, dry mustard, crushed crackers, cayenne pepper, garlic powder, Old Bay seasoning, salt and pepper. Form into 1/2 inch thick patties. Coat the patties with bread crumbs. Heat 1/2 cup oil in a skillet over medium high heat. Cook cakes until golden brown on each side. Drain briefly on paper towels and serve hot.